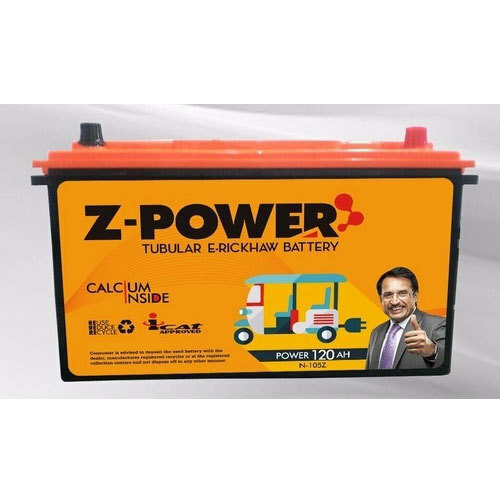 Z-Power E-Rickshaw Battery is extreme Deep Cycle batteries which combine its unique material technology with generation ahead technology for the Indian market. Calcium Tubular Deep Cycle battery launched in India for the very first time which performs well under the extreme hot climatic situation, throughout the day. It is designed to deliver powerfully yet remain alive for longer duration ever after extensive discharges on daily basis. Z-Power E-Rickshaw Batteries are available in 3 technological flavors to offer flexibility and number of choice for the user. All of them are unique in their own state. The excellent cyclic performance with quick charge acceptance. Z-Power Impex Private Limited is the most sought - after the name when it comes to the reliable and efficient Batteries as a dependable Manufacturer, Wholesaler, Importer, and Exporter. We deal in a wide range of Batteries that comprise Automotive, Solar, and Inverter Batteries. These Batteries are developed by the experts and confirm to the international quality standards. We are supplying more than 400 different battery models in the domestic market as well as in more than 30 countries internationally. Z-Power has been made its presence across the Globe by successfully exporting different types of batteries in more than 30 countries worldwide. Also, Z-Power is constantly taking its participation in Domestic as well as International Trade Fairs and Exhibitions to let our customer know our presence is in their local area which boosts their confidence. Our support from the initial order till the goods reaching your door step is up to the mark, following up with all necessary information which helps our customer making an import process smooth. Z-Power has also proven its products success in a real world of industrial batteries, such as Telecommunication Batteries, OPzV and Traction batteries etc.